This tour takes you to two of the most beautiful National Parks of Northern India, known for their Tiger, other animals, and birds sightings. This tour begins with an interesting drive from Delhi to Corbett National Park. Crossing fields of yellow mustard and sugarcane, small villages, bustling towns of Haryana and Uttar Pradesh, you get a glimpse of the diversity India has to offer. Be it natural vistas, architecture, dressing or culture, it is a quick view of the everyday life of Indias common man, sitting in the comfort of your car. Chat with your knowledgeable driver and find out interesting insights into your observations. Before you know it, youll already be at foothills of Himalayas for entry to the Corbett National Park. It was named in the honor of Jim Corbett, legendary hunter-turned-conservationist, best known for hunting man-eating tigers and leopards in the Kumaon and lower Garhwal in the 1920s. Away from the urban concrete jungles, within an easy driving distance of Delhi (6 hrs), Corbett is a popular retreat for wildlife and nature enthusiasts. It provides a great opportunity for viewing wildlife, especially the tiger in its natural habitat. The main wildlife animals found in the Corbett National Park include the Tiger, Elephant, Chital, Sambar, Nilgai, Gharial, King Cobra, Muntjac, Wild Boar, Hedgehog, Common Musk Shrew, Flying Fox, Indian Pangolin and nearly 600 species of birds. Aboard the 4WD, accompanied by an expert guide, the Jeep takes us through the stately dense Sal jungle of Corbett along the Ramganga River. We cross the river at Gethia Rao Bridge for the Kanda Range, where Jim Corbett shot the famous Kanda man-eater. We arrive at the main tourist complex, Dhikala where lunch awaits. You can visit one of the best wildlife libraries here. You can choose to enjoy an elephant ride (subject to availability and on direct payment) or an afternoon safari to sight the elusive tiger and other animals. In the evening one can watch a wildlife film show. The accommodation in Dhikala is basic but comfortable, with en-suite toilets and showers. The tour includes full board at Dhikala, where only vegetarian food is available and alcohol is not permitted. With early morning mist drifting over the river, it can be an exciting experience looking for tigers, wild elephants, and other mammals and birds. Many of the birds we are likely to see are characteristic of the Himalayan region, with a good selection of Palaearctic rarities to set pulses racing. In the evening, we take you to comfortable cottages at Tiger Camp for dinner and overnight stay. The picturesque drive feels like a safari in itself. Next morning we take the comfortable train ride to Ranthambore. In less than 6 hours we will be at the wildlife lodge. Ranthambore is a magical place full of the romance of the wild and intrigue of history. Once the hunting grounds of the Maharajas of Jaipur and the British, it was declared the Sawai Madhopur Wildlife Sanctuary in 1955 and a National Park in 1980. A famous Ganesh temple within the old fort inside the park is still visited by worshippers walking through the forest. The tigers here have been reputed to be fearless of human company and are often seen during the daytime, hence increasing the sightings and popularity among visitors. The current official tiger count is 30. The next two days are dedicated to exploring Ranthambore more. We will take you for an afternoon drive in a 4WD to the park for tiger-tracking and animal viewing. Regardless of animal sightings, there is something magically peaceful and tranquil about a safari journey, the opportunity to be at one with nature surrounded by beautiful scenery is hard to beat. Along with the scheduled morning and afternoon safaris, you can explore the ancient Ranthambore Fort, on whose name the National Park has been named and the Ganesh Temple. A visit to the local village may also be a good option for those interested. Art lovers must also visit the Ranthambore School of Art for the wildlife paintings created by local artists. The school contributes towards tiger conservation. Refreshed with this opportunity to reconnect with nature, full of unforgettable memories of a wonderful holiday, we will take a train ride back to Delhi where the tour will end. Drive from Delhi (6 hours), arriving at Tiger Camp by noon for lunch. Drive onward to Dhangarhi gate for entry to Dhikala tourism zone in a 4WD. 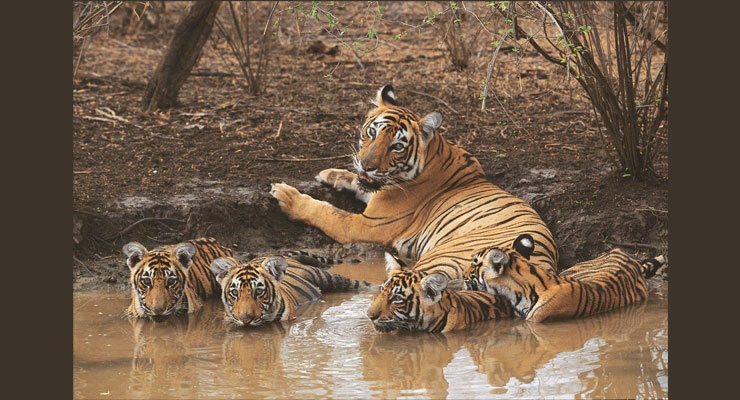 Corbett provides a great opportunity for viewing wildlife, especially the tiger in its natural habitat. We start with a visit to the Interpretation Centre. Accompanied by an expert guide, the Jeep safari through the stately dense Sal jungle of Corbett begins along the Ramganga River Cross the river at Gethia Rao Bridge for the Kanda Range, where Jim Corbett shot the famous Kanda man-eater. Arrive at the main tourist complex, Dhikala. Lunch and relax a bit in the serene, lingering quietness of the park and capture the panoramic expanse on your camera. Please note that the accommodation in Dhikala is not luxurious. If you have not done an elephant ride the previous afternoon, you will be taken on an elephant in the morning (optional and subject to availability) through the open grasslands and dense forests by an unconventional route. Return for breakfast, and then again drive by jeep to the scenic lake area – wait a while for a chance to sight the marsh crocodile basking in the sun. Visit the Jhirnajhali area for viewing the famous gavial – fish-eating crocodile. After lunch, drive back to Tiger Camp. The drive is a safari in itself. Arrive at Tiger Camp for early dinner. Overnight stay in comfortable cottages/rooms. Morning safari through the open chairs (grasslands) and mixed forests in Bijrani Range Forest, a safari that would last about 3-4 hours. Return for breakfast. Drive back to Delhi (6 hours). Overnight stay in a tourist class hotel. You will be picked up from your hotel at 0630 hours for the morning train to Ranthambhor National Park at 0800 hours. Arrive at 1300 hours. You will be met and transferred to the wildlife resort. Afternoon drive in an open truck to the park for tiger-tracking and animal viewing. Overnight in a wildlife resort. Morning and afternoon visits to the park for nature watch and tiger tracking in open-top trucks and/or 4WDs. Overnight stay in a wildlife resort. You will be transferred to the station for the morning train from 0700 to Delhi. Arrive by noon. You will be met and transferred to your hotel. Tour ends. 1. Dhikala closes opens on November 16 every year and closes on June 15. The tours outside these dates will be modified and the safaris will be arranged in the other parts of Corbett National Park.